Welcome to the Flying AJ Ranch! We are the owners, Arlin and Jenifer Fratzke, and we love Registered Angus Cattle. For 20 years, the Flying AJ Ranch has been a long-time supporter of Midland Bull Test in Columbus, Montana. September of each year, we put our best bulls on test at Midland. This year, 2019, our AJR Epic 8131 Lot #9 was the 3rd highest selling bull at Midland Bull Test! Lot #9 sold for $21,500.00 to Brad & Robin Hart, B+R Livestock, Bear River city, Utah. ***A Big Thanks to all of our Midland Buyers! Stevensville is located in the gorgeous Bitterroot Valley of Western Montana, surrounded by the Bitterroot and Sapphire Mountains. Mild temperatures provide an excellent growing season. 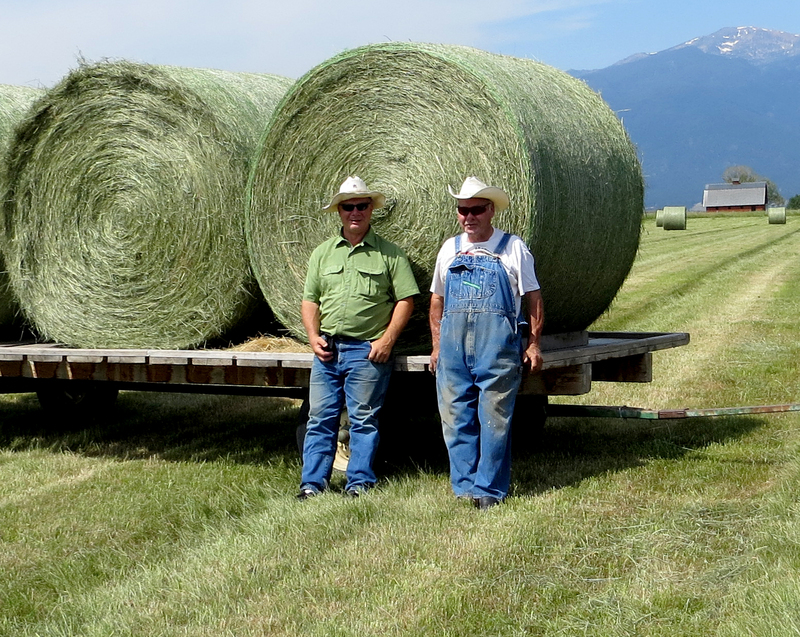 We feed our cattle naturally and choose to operate our cattle ranch as self-sustaining as possible. The Flying AJ Ranch gets its name from our rich history of aviation and agriculture. In 1981, Arlin and I first met in the Alaska “Bush” flying Twin Otters (I was his co-pilot) hauling fish in and out of small villages. 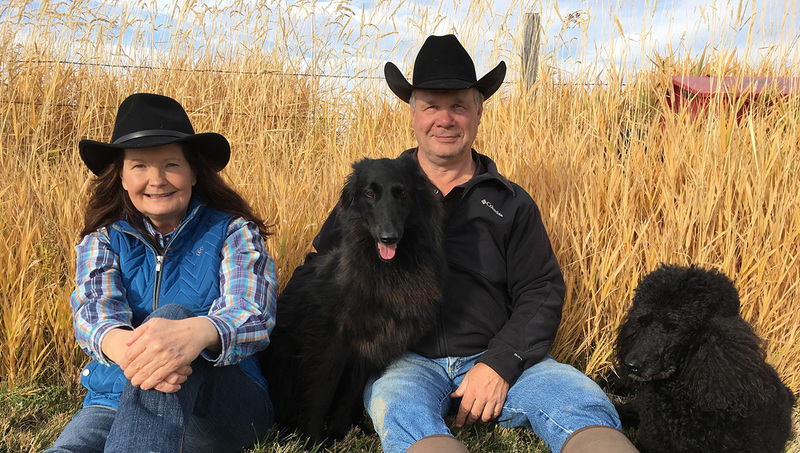 We had so many common interests and a sense of adventure; we married, moved back to Montana, and have worked side-by-side ever since in the Angus cattle business. Our ranch name, the Flying AJ Ranch, is the perfect reflection of who we are as a team and our dedication to our personal mission of ranching. 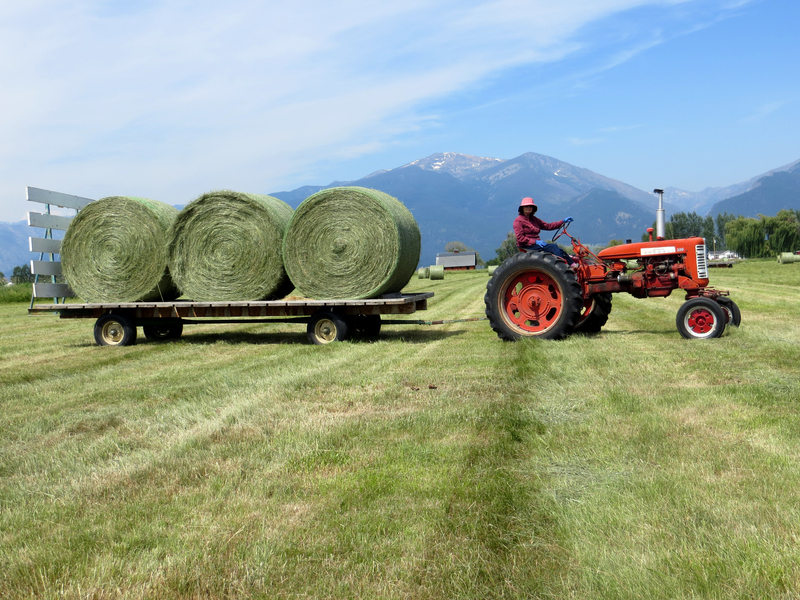 Today if you drive by our ranch, you may see Arlin, Jenifer, and Ron Fratzke, who used to own a nearby dairy in the Bitterroot, working in the field. We have become a working trio. During hay season, you will see the three of us outside, working, until the job is done: me raking hay with my Farmall 230; Dad raking hay with a Farmall Super C; and Arlin baling huge round bales with [my] favorite John Deere tractor that I affectionately call “Gumby.” Our Standard Poodle, “Louie” is a really good helper and loves herding cattle. Our Belgian Sheepdog, “Katie” is learning everyday and has loads of energy. Most of our Flying AJ Ranch calves are born in February and weaned the first of September. The bulls are put on test at Midland Bull Test, “The Granddaddy of Performance Testing.” Through competition, Midland provides objective and comprehensive performance data. Every April, we sell our performance bulls at the Midland Bull Test Sale. Look for our bulls at Midland Bull Sale 2020! Louie our Standard Poodle is the perfect ranch hand. He loves to ride in the tractor, herd cattle, and snuggle. What a buddy!